MinimOSD “On-Screen Display” is a small circuit board that pulls telemetry data from your APM or Pixhawk flight controller and over-lays it on your First Person View monitor. 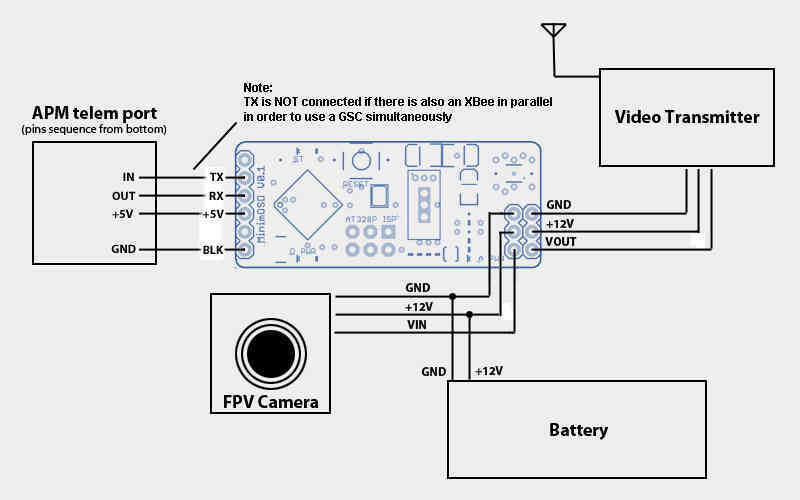 This article provides brief instructions for how to connect the board. For more detailed instructions please refer to the MinimOSD Project wiki. The Minim OSD was designed and programmed by Sandro Benigno and Jani Hirvinen. It is available from jDrones here. 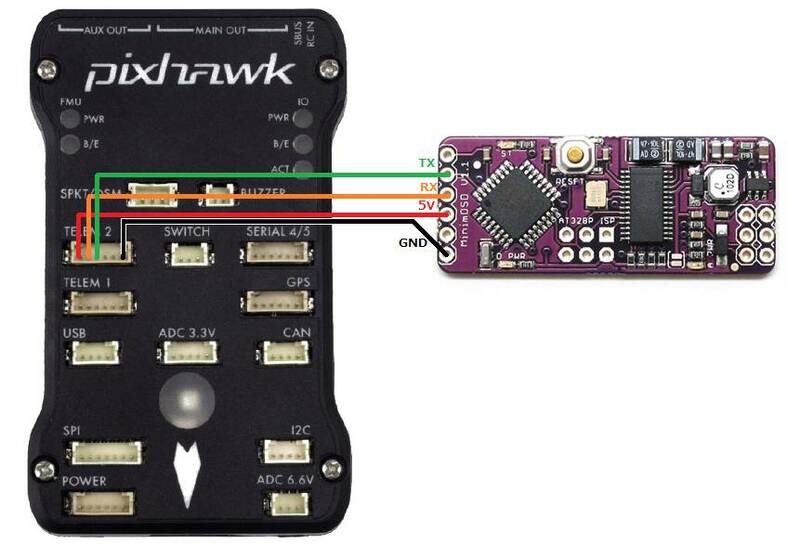 To connect to Pixhawk, use this DF13 6-pin cable to connect to the TELEM2 port. 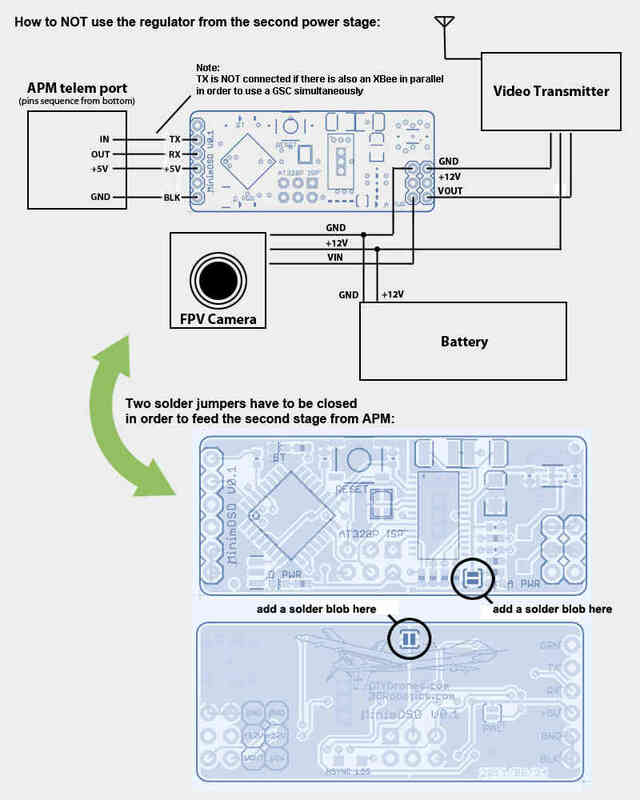 To connect to APM 2.5 and 2.6, use a 5-pin splitter cable that allows the telemetry port to be connected to both a SiK Radio and the MinimOSD. 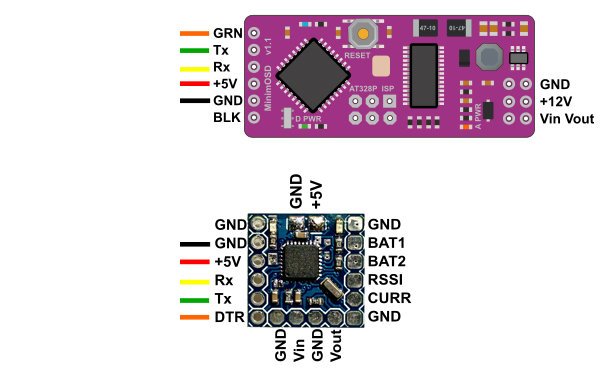 The orignal MinimOSD’s power setup provides two stages to avoid noises coming from servos attached to your ArduPilot boards. Those noises could introduce some glitches on video signal. The independent analog powering from a dedicated battery will heat the board considerably, but the video is the most clean as possible from MAX7456. Maybe you don’t need to use the two stages. The way those noises would impact on the video signal will vary depending on a chain of aspects like servo’s brand, model, cables length, etc. So, try yourself and see if it’s important for your setup. Core functionality is broadly similar between the two firmwares. The project is located here. The documentation is located here. The support thread is located here. MWOSD is a very popular OSD which has been around for many years initially supporting the muiltiwii based flight controllers - iNav, betaflight, etc. Recent versions now provides full support for Ardupilot based FC. MWOSD has an easy to use GUI configurator which has the added advantage of being able to flash firmware versions directly from within the GUI. Arduino or third party software is no longer required. MWOSD continues to be actively developed and supported. After some time with a stalled development of the firmware for the MinimOSD boards due to reaching the limit of the code size, a new developer (https://github.com/night-ghost) picked up the project and through some clever development effort managed to bring it back to life. TLOG player in configurator - now settings can be checked without working plane/copter! Pre-compiled binaries and HEX files are in the Released folder with the CT GUI. If you are willing to compile your version from the GitHub repo, the following mini guide is quite useful. The developer also provides a convenient ready to use package that includes all the required files in their latest version here: OSD latest. The minimOSD w/ KV team mod is adds extra analogue/digital IO pins for direct voltage, current and RSSI measurement. The Micro MinimOSD board is only 15mm x 15mm and is ideal for micro UAV projects. The AEROMAX is slightly smaller than tradional minimOSD, has the additional KV mods,further I/O pins, a more efficient power consumption and a hardware IC that is far more resilient to power fluctuations providing a cleaner imnage.